Girlia's Cards: How about Something Sweet? Thanks for stopping by. I hope you are ready for this post. Guess what? I was playing around today and I have (I think) invented another kind of pocket card (don't get too close I think these things are contagious--lol). I have not seen this kind of card before on anyone's blog. Yep, another kind of pocket card. I call it a Matchbook Pocket Card. There is just something about having a secret message/present inside. I hope you like it. I used scraps from previous cards (that is always a plus--lol). Well, tell me what you think. Comments are welcome. Enjoy and GOD Bless. Emma's Imagination Monday Challenge-The theme is "Sweet"
Hi Gloria, thanks for stopping by My inkin spot. This card is so cute and I think you are right, I have never seen one like it, GREAT JOB! I LOVE IT!!! Very cool idea! I'm to lazy to do different folds. I love the card! Great matchbook card! Love the papers and awesome all scraps! Very cute and I love how you have the pocket inside. Thanks for playing along with us at FCCB this week. I love your invention! Very cool, and the whole thing is super cute! I was just admiring that cut on my Imagine today. Looks great with the polka-dots! Very cute card! lOve the ice-blocks! So cute, love the little pocket! Very clever. And cute too. They look so real and yummy!! I LOVE your card..great job. Wow! That is very creative! You did a great job! I think it's fantastic and the ice cream looks so real! Girl, you are just too much, love this idea, YOU ROCKED this!!! Very cute pocket card. Thanks for joining the FCCB challenge. That looks so appetizing right now!! :) Thanks for sharing! really cute.love the polka a dot paper with the bright color popsicles.really cute inside tag.good luck with the challenges. I love this card! Those popcicles look SO YUMMY! I love this card! The Popsicles are so cute and the pull out tab is really neat! Really great card I love it a bunch. I need to learn how to make one. I came over to grab the attitude button but couldn't figure out how to. I love this one but it looks really hard to put together. But the popcicles look so real and so yummy. But the part you pull out looks like it is really hard to do. BUT if I saw someone make it it might be easier to do. But I love it. Thank you for sharing. 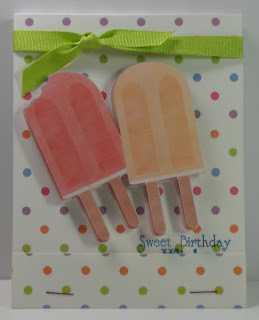 Love the card,the popsicles yummy. Great job!! You make the best cards ever! I love your popsicle card... and the pull out is very cool! I LOVE your card and the matchbook idea is wonderful! 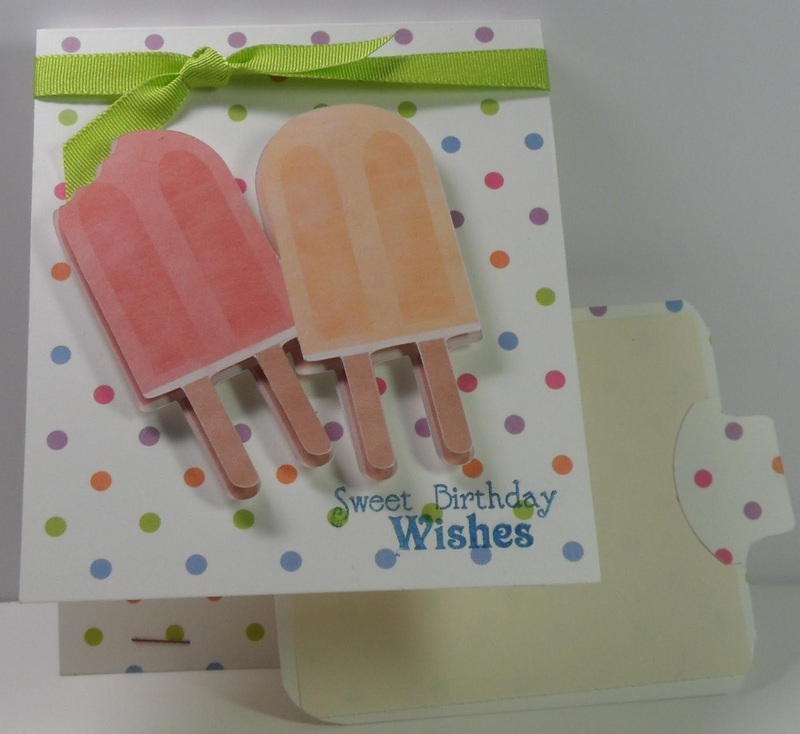 Love all the colors and your Popsicles look very real, like an orangesicle and raspberrysicle, yum. Great job!! super cute! those popsicles look good enough to eat. I am awarding you the Stylish Blogger Award. I know you have received this award a few times but I had to award it to you again. I just love your work and your blog. What a great card! Those popsicles look fabulous! Super job with your new pocket card style too! Such soft pretty colors! just makes me smile... makes me think of summer!